Definition at line 59 of file ProgramPoint.h. Definition at line 61 of file ProgramPoint.h. Definition at line 101 of file ProgramPoint.h. Definition at line 114 of file ProgramPoint.h. Convert to the specified ProgramPoint type, asserting that this ProgramPoint is of the desired type. Definition at line 140 of file ProgramPoint.h. 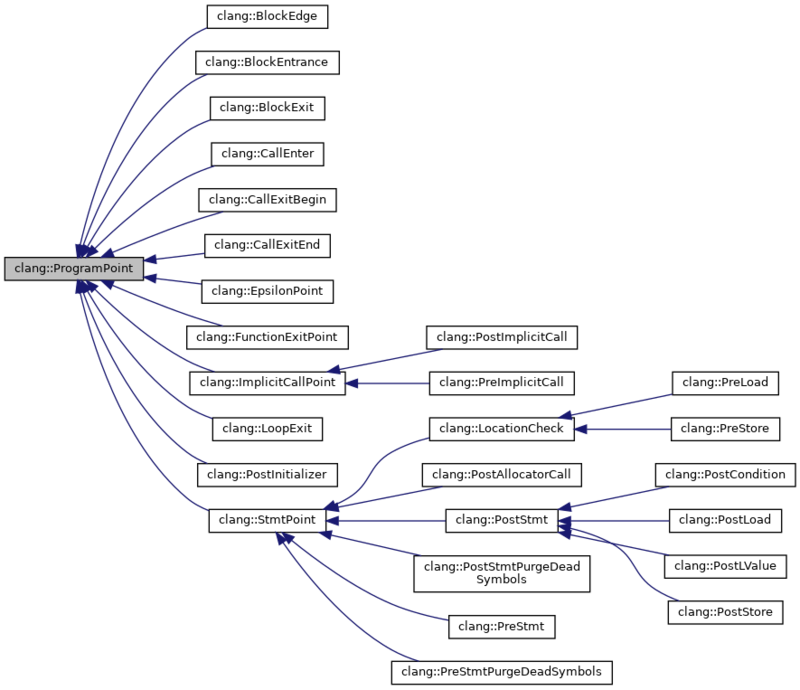 Referenced by clang::ento::CoreEngine::dispatchWorkItem(), clang::ento::ExprEngine::evalEagerlyAssumeBinOpBifurcation(), clang::ento::StackHintGeneratorForSymbol::getMessage(), clang::ento::ExplodedGraph::isInterestingLValueExpr(), clang::ento::ExprEngine::VisitGuardedExpr(), and clang::ento::ExprEngine::VisitLogicalExpr(). Definition at line 45 of file ProgramPoint.cpp. Convert to the specified ProgramPoint type, returning None if this ProgramPoint is not of the desired type. Definition at line 151 of file ProgramPoint.h. Referenced by alreadyExecutedAtLeastOneLoopIteration(), CompactMacroExpandedPieces(), clang::ento::PathDiagnosticLocation::create(), clang::ento::PathDiagnosticLocation::createEndOfPath(), clang::ento::CoreEngine::dispatchWorkItem(), clang::ento::CoreEngine::enqueueStmtNode(), clang::ento::ExprEngine::evalEagerlyAssumeBinOpBifurcation(), generatePathDiagnosticsForNode(), clang::ento::ExplodedNode::getLocationAs(), clang::ento::CheckerContext::getLocationRegionIfPostStore(), getLocationRegionIfReference(), clang::ento::BugReport::getStmt(), clang::ento::PathDiagnosticLocation::getStmt(), clang::ento::ExplodedGraph::isInterestingLValueExpr(), clang::ento::WorkList::makeBFSBlockDFSContents(), clang::ento::WorkList::makeUnexploredFirst(), clang::ento::WorkList::makeUnexploredFirstPriorityQueue(), clang::ento::ExprEngine::VisitGuardedExpr(), and clang::ento::ExprEngine::VisitLogicalExpr(). Definition at line 125 of file ProgramPoint.h. Definition at line 126 of file ProgramPoint.h. Definition at line 188 of file ProgramPoint.h. Referenced by llvm::DenseMapInfo< clang::ProgramPoint >::getHashValue(). Definition at line 160 of file ProgramPoint.h. Referenced by clang::ento::CoreEngine::dispatchWorkItem(), and clang::ento::WorkList::enqueue(). Definition at line 179 of file ProgramPoint.h. Referenced by clang::ento::PathDiagnosticCallPiece::construct(), clang::ento::PathDiagnosticLocation::create(), clang::ento::CoreEngine::ExecuteWorkListWithInitialState(), clang::ento::ExplodedNode::getLocationContext(), clang::ento::BugReport::getStmt(), clang::ento::ExplodedGraph::isInterestingLValueExpr(), clang::ento::ExprEngine::processCFGBlockEntrance(), and clang::ento::PathDiagnosticCallPiece::setCallee(). Definition at line 20 of file ProgramPoint.cpp. Referenced by clang::ento::CheckerManager::runCheckersForCallEvent(), and clang::ento::CheckerManager::runCheckersForEvalCall(). Definition at line 183 of file ProgramPoint.h. Definition at line 177 of file ProgramPoint.h. Referenced by clang::ento::CheckerContext::generateErrorNode(), clang::ento::CheckerContext::generateNonFatalErrorNode(), clang::ento::ExplodedGraph::isInterestingLValueExpr(), and clang::ento::ExprEngine::VisitObjCMessage(). Definition at line 171 of file ProgramPoint.h. Definition at line 201 of file ProgramPoint.h. Definition at line 194 of file ProgramPoint.h. Definition at line 59 of file ProgramPoint.cpp. Definition at line 208 of file ProgramPoint.h. Definition at line 127 of file ProgramPoint.h. Create a new ProgramPoint object that is the same as the original except for using the specified tag value. Definition at line 132 of file ProgramPoint.h. Referenced by clang::ento::CoreEngine::enqueueStmtNode(), clang::ento::NodeBuilderWithSinks::generateNode(), clang::ento::NodeBuilderWithSinks::generateSink(), clang::ento::CheckerContext::getCalleeName(), and clang::ento::CheckerManager::runCheckersForEndAnalysis().